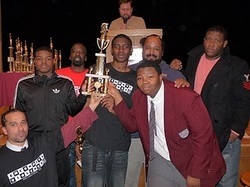 The Walter D. Palmer Leadership Lions Dark Knights has put together one of the best scholastic chess teams not only in Pennsylvania, but also around the country. The team recently competed in the Greater Philadelphia Chess League and two players scored five points out of 10 matches. Gary Spencer and Destin Whitfield each scored five points. A month ago, the team had three standouts in the city all-star game. The team had Vanita Young, Dwayne Darby and Spencer representing the all-star team for the South. Masterman and Palumbo both had one chess player on the all-star team, too. The school also competed at Chess Nationals in Nashville, Tenn. The team placed 21st overall in the country. They received a trophy for their performance in the under 1600 section. This was the second highest section at the event. The team’s top performers were Spencer (5.0, 1395), Young (4.0, 1,429), Dwayne Darby (3.0, 1362) and Whitfield (2.0, 1228). The team is preparing for the World Open in July. WEST PHILADELPHIA - June 17, 2011 (WPVI) -- It is a story of triumph over adversity. A Philadelphia teenage girl has overcome several big obstacles in her young life, and finds herself about to play in a chess championship. But it is how she got there that makes her story so interesting. The chess term is called "End Game". 17 year old Vanita Young of West Philadelphia is seen as a rising star in the world of Chess after she beat out 600 girls at the Pennsylvania State Scholastic Chess Championships last March. But her path to victory has also been filled with much sadness. "My dad passed away when I was 13, he had diabetes, and I was abandoned by my mom when I was two," said Vanita. While trying to deal with her sorrow and turmoil at a young age, a man attempted to assault her one day while walking home to her grandparent's house. Vanita managed to get away. The bright spot in her life came when she was in 6th grade, and a middle school teacher saw her sitting outside alone and invited her to learn the game of chess. "She brought me in there and taught me how to move the pieces and from that day on, I went to every practice," Vanita said. She became so good at chess, the Walter Palmer Charter School junior has been invited to the Susan Polgar Girl's Invitational in Lubbock, Texas in July to compete for $120,000 in scholarships and prizes. "It was exciting, I was like speechless. I went up there for my award; I was so red I couldn't even talk," said Vanita. But there was only one hitch, Vanita needed $2,000 to attend; money that she and her retired grandparents did not have. "It was sad, but I couldn't do much at that point, since I didn't have enough money for it," Vanita said. Congressman Bob Brady came to the rescue after reading about Vanita's story Friday morning. "We contacted one of my guys, Kenny Smuckler, contacted the charter school people that we know, Students First, and we told them to read the story. And they told us that they would help us raise the money to send this young lady to Lubbock, Texas," said Congressman Bob Brady. "I was so excited, I was running through the living room," said Vanita. "It makes me feel that there are good people out there and that people care and want to see my dreams come true and that made me happy on the inside." The Walter D. Palmer Leadership Lions Dark Knights chess team has developed into an outstanding program. A year ago, they were 5-3 in the city chess league. Dwayne Darby won the world open in Valley Forge last July. Darby has scored 109 points this year. He beat the No. 6 player in the state. Gary Spencer tied for third, beating the No. 13 player in the state. Spencer scored 109 points in the competition. Destin Whitfield won third place at the Atlantic Open. Whitfield scored 96 points. He has a 7-0-1 record this season. Vanita Young is the top female in the city of Philadelphia and the state that plays high school chess. Her rating is 1482. She scored 120 points as the first board this year out of 160. She currently ranks 18th in the state. The Dark Knights chess team has been able to compete with Masterman, which annually has the best chess team in the city. Douglas Cox is the head coach of the Dark Knights chess team. Cox has coached some brilliant chess players. The Walter D. Palmer Leadership Academy has the top chess club in the state for under 1300 players. The Dark Knights recently brought home the state championship with contributions from a number of teammates. Gary Spencer tied for second in the state under 1300 with four points. Dwayne Darby was 16th in the state for under 1300 and Destin Whitfield was 26th in the state for under 1300. Each had three points. Vanita Young won a scholarship to the Susan Polgar Female Championships in Texas in August for being the top female player for her age in the state. This is the Dark Knights first state championship. The team did very well under the tutelage of head coach Douglas Cox and Lateef Street of Masterminds Chess Club and coach David Miller. The Dark Knights hope to compete at the nationals on April 29. Walter D. Palmer School Coach Douglas Cox was elated with the 3 trophies his team brought back this year, compared to returning empty handed after their first states appearance last year. Among the 3 trophies, was a team award for fifth place in the 7-12 Under 1300 section. Cox attributes their improvement to his players competing in ASAP’s free Saturday chess tournaments, which prepared them for states and allowed them to increase their United States Chess Federation ratings by 700 points. Cox said two of his students are juniors who are interested in applying for the chess scholarship awards next year.